EM-138 is 30 leds bar display. The meter has two measuring ranges: 4...20mA or 0...10V. 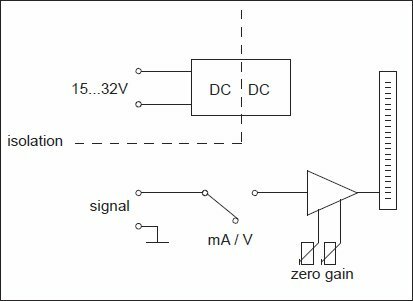 Signal input is protected against overvoltage and overcurrent. The supply voltage is galvanically isolated from signal stage. Unit has zero and gain trims for signal adjustment. The range selector switch and the adjust trims are located in the rear panel of the device. The color of the display is red-orange. The background color of the meter is black and the markings are white.